Tek-Tanks S3 Series electrical water senders are fitted as original equipment by most major UK boat builders. Made from a stainless steel head assembly with a stainless steel tube, they are reliable and easy to install. A float, holding twin magnets, rises and falls with the water level and triggers a series of electronic switches housed and sealed within the tube. Gauges to suit the S3 range can be found here. The system is simple and with no mechanical moving parts to wear, it is very durable and can withstand the constant movement of the contents much better than the ‘car type’ floating arm sender. The sender head has a 1 1/4″ BSP male thread, with double ‘O’ rings for an efficient seal. We offer a series of Fitting Flanges to suit most situations. Our senders can be custom built to replace faulty floating arm units, including the American specification which works in reverse to the UK version. The sender is supplied to suit the depth of the tank and is calibrated during manufacture. Fitting is as easy as screwing in the sender and joining two wires to the gauge. 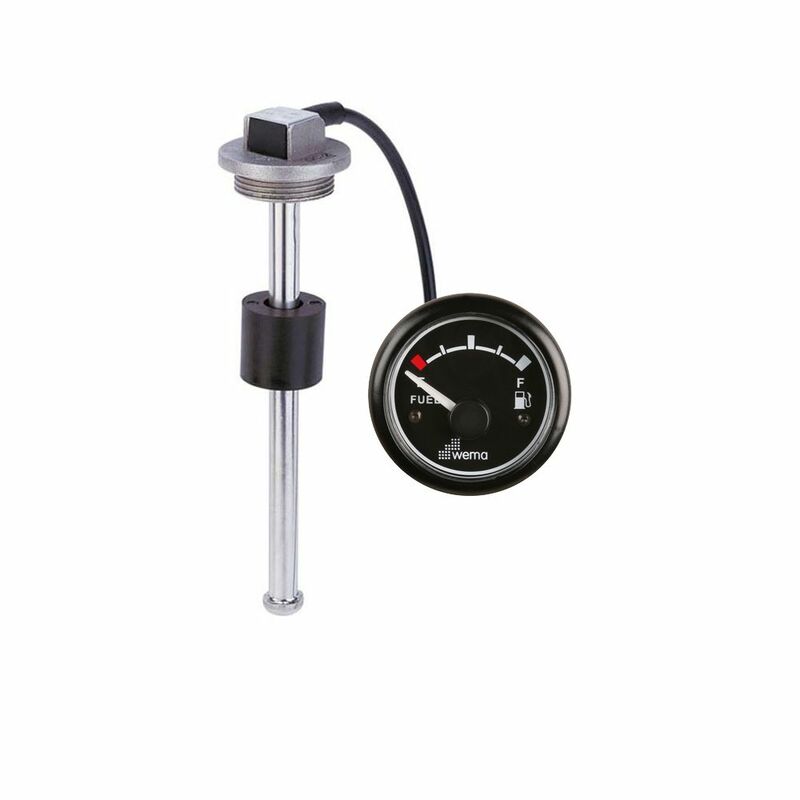 At extra cost, we can supply senders to trigger any type of gauge, or have special calibration for heavily shaped tanks. As standard we keep senders in stock ranging from 200mm to 600mm in 50mm increments and standard resolution. High resolution is available for senders up to 400mm long to special order. Specials can be ordered but can take up to 10 days to supply. For a twin tank installation that has isolated tanks and the contents of each tank need to be read separately, then a dual panel is available which uses a common gauge and a simple switch which is normally off but can be switched to read the contents of each individual tank. Please phone for more details. Tek-Tanks water senders can also be used to switch a pump on and off if used with a relay block designed specifically for the purpose, ideal for automatically emptying grey water tanks used for sink and shower waste. Give us a ring to discuss your idea and see how we can help. You may find that you need to monitor one tank from two positions, for example, you may want to see the contents of a fuel tank from your flybridge as well as from the wheelhouse, if so, then the Dual Station Converter will allow you to set this up. The Dual Station Converter will also average out the contents of say a tank under the floor of a rib by using two senders, one each end of the tank. When the fuel moves to the rear of the tank when the bow of the boat is raised under power the unit will take the high reading from the aft sender and the low reading from the forward sender and average the result giving an accurate output to the gauge. Our analogue gauges, suitable for water, waste and fuel come with a black radiused bezel and a black background with white print.